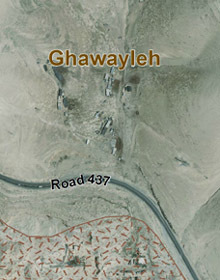 Residents live alongside and north of Road 437, which leads from Road No. 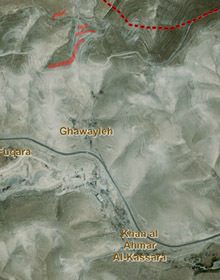 1 towards A’nata, west of Al-Khan Al-Ahmar, and southwest of the Kfar Adumim settlement. This community also originated in the area of Tel Arad, and was deported from there in the early 1950s. After moving to the area of Hebron and Bethlehem, it took up residence in its present location. The original choice of location arose from the site’s proximity to the E’in Fara water source, to which residents no longer have access. When residents arrived at the site, they settled on private lands belonging to A’nata, and today as well, the locality sits partially on these private lands and partially on registered state lands. One can see that there has been ongoing residency there at least since the 1970s. Some of the locality is within the jurisdictional area of Ma’ale Adumim and E1, but most of it is outside. In the mid-1990s, and again recently, demolition orders were issued for a number of structures there, and in the past, two homes were even demolished. In addition, residents have been prohibited from adding new construction or making any changes on existing houses, and cultivation of lands for agriculture is forbidden. Raising flocks and grazing is almost the only source of livelihood for residents, but this option is also very limited. The grazing lands have been closed almost entirely to residents, and for the most part, the livestock are in pens, sustained mainly by feed purchased by the residents, a burden that makes it difficult to continue raising them. The resulting milk products serve mainly for domestic use. Some twenty pupils, boys and girls alike, commute to school in A’nata via organized vehicle transport. High-voltage power lines pass near the locality, but predictably, the houses there are not connected to the grid. Although the residents were present at the site long before the electrical lines were installed, the lines were established with utter inattention to the existing residents and in a manner that is hazardous to their health. 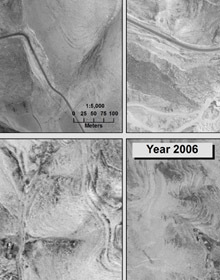 Moreover, the sewage lines from the nearby settlements pass close by the locality en route to the sewage treatment plant located at the lower part of the wadi. Sometimes, when there are malfunctions and leaks in the lines, residents are subjected to foul odors and pollution.